George Graham reviews B.B. King & Eric Clapton's "Riding with the King"
Putting two independently well-known artists together on one album has always been a way of generating audience interest. Sometimes, that is the result of genuine desire on the part of the artists to work together. But more frequently, it's a case of record companies and producers deciding that such a joint superstar combination would be an effective marketing tool. Rarely, do such joint recordings turn out to be much of an artistic breakthrough for the participants. In fact, most turn out more to be novelties than anything particularly significant. This week we have a very high profile blues collaboration, initiated by the artists themselves, that yields worthwhile results. It's the new joint album by B.B. 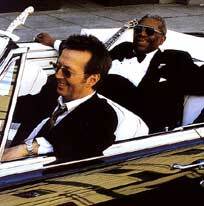 King and Eric Clapton, called Riding with the King. Blues institution Riley B. King and British rock superstar Eric Clapton first met in 1967, when they both performed at an after hours jam session at New York's Cafe Au Go Go. They have kept in touch over the years and would occasionally play together on stage, when they two happened to be in the same place at the same time. While King's music has been the epitome of the blues, Clapton's output has been more varied in both style and quality, ranging from the power rock of groups like Cream and Derek & the Dominoes to more pop-oriented records. In the 1990s, Clapton re-addressed himself to the blues and released a couple of outstanding recordings, but also, for whatever his reasons, then took a more commercial pop direction on his last album, the multi-platinum but artistically dreadful Pilgrim which featured unctuous arrangements with automated hip-hop influenced drum loops and samples. Clapton was reportedly weighing his options for the direction of his next release, mulling whether to do another mass-market hip-hop culture clash or return to the blues -- an acoustic album was reportedly under consideration -- when he approached B.B. King, and was able to get King off the road for a month in January and February of this year to do a joint recording. Clapton chose the songs, subject to approval by King. The material ranges from remakes of some of King's early hits to a couple of pieces by the young Texas guitarist Doyle Bramhall II, whose father had played with Clapton. It's interesting that Clapton waited until now, at age 55, to approach King about a joint recording, feeling previously that he might not yet have been able to acquit himself in King's presence. In Clapton's words "I began to feel that maybe I had found my footing enough as a musician to be able to share the same space" as King. It's immediately apparent that the two work well together on this recording and sound as if they are having a great time. Both write in the liner notes that the CD represented a dream fulfilled. Despite the fact it was co-produced by Clapton and released on his record label, Clapton insisted that King's name given first billing. The two guitar-meisters recorded Riding with the King with members of Clapton's band, along with ace studio musicians like drummer Steve Gadd and keyboard man Joe Sample. But the personnel line-up on the album tends to be bigger than it needs to be, with sometimes as many as five guitarists and two keyboard players present on a given song, and the added background singers don't help the cause much. The supporting guitarists include veteran British player Andy Fairweather Low, who is a part of Clapton's current band, Doyle Bramhall II, and Jimmy Vaughan, founder of the Fabulous Thunderbirds. Also from Clapton's regular band is bassist Nathan East, who played mainly acoustic bass on this CD. King does a majority of the vocals, though both he and Clapton take turns, and both do well. But the album's high points are definitely the guitar exchanges between the veteran bluesman and the now mature British rock star who was such a flash in his youth. Combinations of such major figures as B.B. King and Eric Clapton are still relatively rare on record and thus much-anticipated by fans. When artists of this level but with different backgrounds get together, one always wonders how compatible they will be. In the case of King and Clapton, both have been fans of each other's work for years, and their musical rapport on Riding with the King is downright contagious. They seem to raise each other's level of playing, with some memorable guitar work through much of the CD. The result is an album that for the most part lives up to expectations. The quibbles I have concern all the extra players. One track features five guitarists including King and Clapton, two keyboard players, plus the rhythm section. Sometimes, the spirit of the guitar-oriented blues, which thrives on simplicity, can get crowded out among all the added players. The other minor complaint I have concerns the recorded sound -- there is some noticeable distortion that shouldn't be there, especially on B.B. King's guitar and vocals on a few tracks, though not on all. Also the acoustic bass, which should provide a great old-time blues sound ends up sounding anemic and indistinct. It's doubtful that there was a need to economize on the recording budget, so one might have expected a bit better. But overall, it's a decent-sounding CD, especially compared to other recent major label releases. Having B.B. King and Eric Clapton together for a whole album is definitely a treat for the increasing number of blues fans, and perhaps will serve to widen further the audience for Mr. King from among Mr. Clapton's fans. In any case, it's an album that largely fulfills the high expectations for such a significant collaboration.